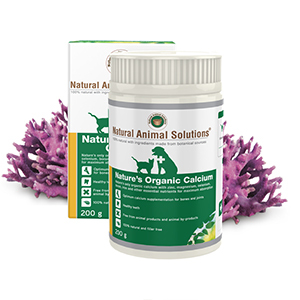 Natures Organic Calcium Pet Supplement is an organic plant-based calcium containing naturally-available zinc, magnesium, boron, iron and also other essential nutrients. Furthermore, this high-potency low-dosage formula is easy to supplement for all animals, allows for rapid absorption and also is highly cost-effective. With a dose 8 x less than many other products available in the Pet Market.Moreover, Calcium is the foundation block for building strong teeth and bones and our aging pets also benefit from a natural calcium source. As a result, Natural Animal Solutions are proud to bring you one of the only 100% certified organic bio-available calcium products available in the pet segment, ideal for supporting bone growth and to maintain bone strength. Calcium deficiencies are still a common occurrence in companion animals, despite the claim by many pet foods that their diets are “complete”. Since Calcium is the foundation block for building strong teeth and bones, you must ensure that your pet is receiving an adequate intake of bio-available calcium when they are young and growing rapidly. Aging pets also benefit from a natural calcium source to prepare their bodies for the changing nutritional needs. Many older pets also cannot chew bones as readily as they did in their younger years and need a natural, easily digestible calcium supplement.